The apprentices to the Master Wizard have accidentally lost some objects in the The Magic Labyrinth! Now, they must try to collect them before the Master notices they're missing. However, this magical maze has invisible walls that the little wizards keep bumping into, forcing them to start all over again! Sharpen your memory and show your skill as you navigate the maze and win the Master Wizard's favor! You have to move an character through the board but, you're trying to do so with a labyrinth below the first board. The character is joined with a magnetic ball, so, if you hit a wall, the ball drops and you have to start again. Any game that totes magnets in it is a winner already, but this game goes further than that, in my opinion. In this game, you have to travel through an unseen maze in order to collect a number of symbols. Your token consists of a lovely hat which you push around the board, but underneath it holds the physical attention of a mystical ball. When you move through the spaces, the ball remains transfixed when you are moving through open space, but when you move through an unseen wall – UH OH! – the ball falls and you return to your corner. Through your journey, you will hopefully remember which ways are open, and which ways are blocked. Setup – you construct a maze either by following directions included in the game with variable difficulty, reading online to determine a preferred method, or doing your own thing and making sure to follow the only rule – every tile has to be accessible. Gameplay is quick, but can be lengthened or shortened by the requirement of symbols. When we played, the goal was to obtain 5 symbols, and it took us about 10 minutes. Final thoughts – replay value is assured, with all kinds of invisible awesomeness going on. Simplicity of learning the game is definitely there, and the magical theme is awesome as well. Lots of fun! I bought this one for my son a couple of years ago, and I was as excited to check it out as he was (maybe even more so). The idea of a path hidden beneath the play area with players trying to follow that path intrigued me. 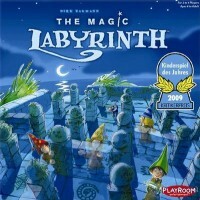 I really like the theme of Labyrinth, and the quality of the components and artwork is good. Players set up a series of heavy cardstock partitions on a plastic grid to make up the maze in Labyrinth. Then a square game board with a corresponding grid is placed atop the lower grid. Players blindly draw tokens from a bag, and each of the tokens represents a treasure location on the board. Two to four players begin the game in separate corners of the board. Pawns have a strong magnet that attracts a metal ball below the board, so pawns must be slid along a player’s chosen path. Lifting the pawn (or bumping into a partition) will cause the ball to drop and return to the player’s starting corner, which means the player must reset his pawn in the corner and begin the path again. It is quite challenging to remember the path and where the partitions are set. I recommend starting with just a few of the partitions, as a difficult path will become frustrating to new or younger players. There are more than enough of the partitions to make simple or highly complex mazes. When a player collects five treasures, the game ends. Labyrinth is a novel concept in a lovely package. The replay value for my family has been just average, but it is a fun game worthy of a few plays.